This picture pretty much sums up the temperatures here in Oregon. Everything outside is frozen solid. I suppose we’ll now call this the bird’s ice skating rink. These ice puddles are also everywhere at the vineyard property where we continue to work even though conditions outside are less than favorable. It’s supossed to be colder tomorrow, sixteen I think…yikes. However, all the holiday decorating is done so that is one major stress relief. 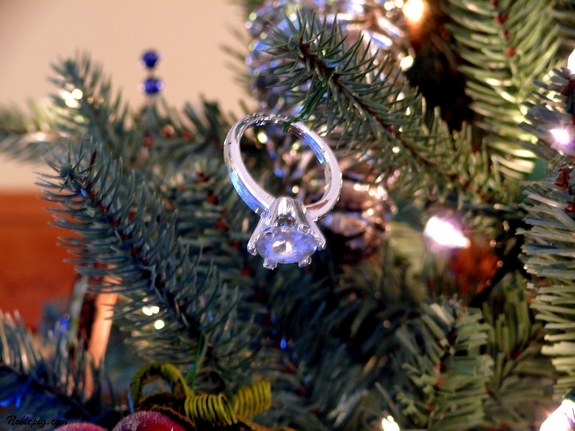 Here is my favorite ornament, which is much larger than it appears…he-he. Since we celebrate Christmas and Hannukah, the house is overall very festive. 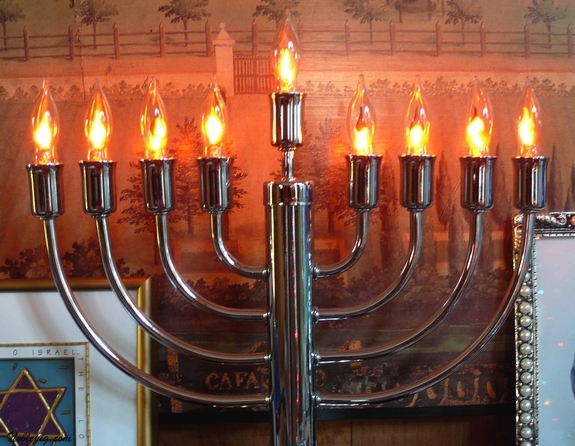 I love this cheesy electric menorah as much as the Christmas trees. 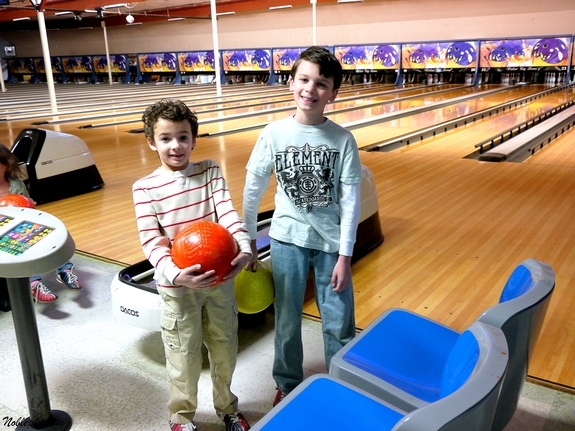 My boys did get some bowling in at Walnut City Lanes for a birthday party. They loved it of course. And I finally stopped at my one of my favorite family farms in town, Schmidt Farm, and picked up my roasted hazelnuts, walnuts and prunes for holiday baking. When I walk in this place the warmth and smell of the hazelnuts roasting send me into a buying frenzy. If that’s their marketing plan, it works. I killed my poinsettias. I have always kept them outdoors…in California. So without thinking it through, I put them outdoors here in Oregon. Needless to say, they don’t like 20 degree temperatures. I don’t blame them. And I bought more, new holiday teas!! I also finally started our Noble Pig Vineyards Facebook page, join us if you haven’t already!! I love all your photos!! I really love the ornaments AND I have got to look for those teas! I drink the Bigelow Plantation Mint throughout the day at work. I love it! Looks like we’re in for a good dose of cold Oregon weather. Sure hope it doesn’t snow like it did last year. The smell of roasting hazelnuts is the best! Oh, your poor poinsettias, Cathy! Fun to see all your Christmas & Hannukah decorations. Always love your collections of photos! Haha on the ornament. My favorite one is a sterling silver jingle bell on a red ribbon. 🙂 Very cool on the hazelnuts. Stay warm! 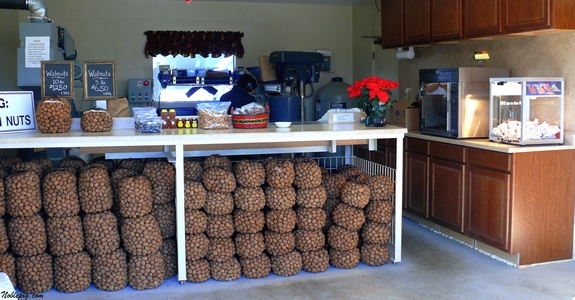 Holy crap, I want fresh roasted hazelnuts. There has to be someplace in Boston that does that. My weekend? It was chaos, but it’s pretty much done now. We woke to zero.. Tomorrow, like you said will be colder! Oh joy on the East Side of the state! Wow everything is totally frozen there! Who knew Oregon got so cold…love your new Facebook page…can’t wait for the wine! Holy cold! Supposed to get 6-9 inches of snow tonight and tomorrow! Snow day??? Fresh roasted hazelnuts??? I want some! Do they have a website? Busy, busy! And breathe…..Have a great week, Cathy! Mmm.. the aroma of fresh roasted hazelnuts must have been amazing! Great shots. The cold snap has us keeping the wood stove in full operations. PS I too love the tree decoration! Ummm…yeah. You know I know about the killing the plants thing. It’s been so cold here that everything has either been inside or bundled up like the kid brother in ‘A Christmas Story’. Maybe now all I need is a Red Ryder BB gun to kill them when I know they’re done & they haven’t quite figured it out. Oh and the Hooligans look adorable. Your youngest has curly hair like Mr. Snoots. I love it! They are both so gorgeous & wholesome looking. Oh those poor poinsettias, I just bought one myself for the Christmas table, it certainly won’t be wilting cause of the cold here, lack of water and heat maybe. Brrrrrrrrr!!! We are experiencing the very same weather, and you know, I just want to stay indoors and cook and bake all those yummy recipes you posted that I have been unable to find time for. I think I will be staying in all week…your bird bath / skating rink looks beautifully forbidding to birds, kind of lie the outdoors right now. Your photos are so good they made me shiver! And love your comment about killing your poinsettieas! If you ever actually see birds skating on their birdbath, I sure hope you snap a photo! It is beginning to look a lot like Christmas, huh? I’ve been looking all over for those teas and I can’t find them around me! I’m not giving up though…they sound so good! I spent my weekend decorating also… Love your photos! I think I’ve said this before, but I’ll say it again – I absolutely LOVE that you share Oregon with us, so thank you so much! Your efforts are appreciated. Don’t you just love the symmetry of the hazelnut orchards too? They amazed me the first time I saw them. Weather’s bad here too – we had a storm blow through last night that was incredible and I can’t see the mountains this morning, which means it’s snowing up there. Yup -snow in Tucson. Who’da thunk. OMG, I can’t even imagine what roasted hazelnuts would smell like – yum! I am really liking pecans lately – I am posting a recipe tonight for toasted pecan pancakes – they were so good! It’s cold here, but not that cold. 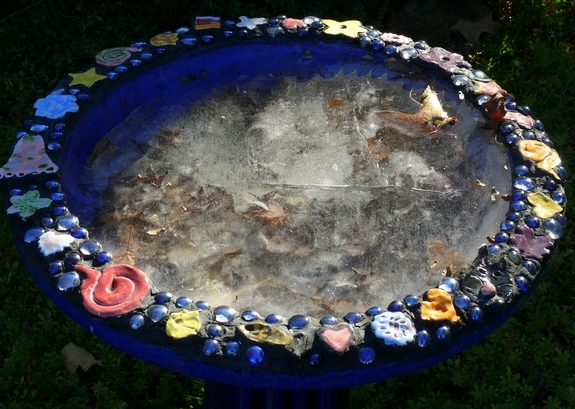 I sent hubby out to pour some hot water in the birdbath to melt the ice, so the birdies could have something to drink. your decorations look lovely. It’s cold here too, we had some snow! We usually have 1 week of really hot and 1 week of really cold weather here. It’s almost over. Have you tried wearing a couple of pair of laytex gloves under the ones you use for work at the vineyard. Might help. I was a bit put off by this weekend’s weather. I was out at the barn, complaining about the cold. There was some snow, but it was mostly north of me. I hardly saw more than sleet close to home. Thanks to your photos of ice puddles and 16 degree temps, I will now stop complaining about temps that barely drop to freezing at night. New York is nice and toasty warm! That is a beautiful birdbath/skating rink BTW. Can’t wait to see what you’ll be baking with those supplies. 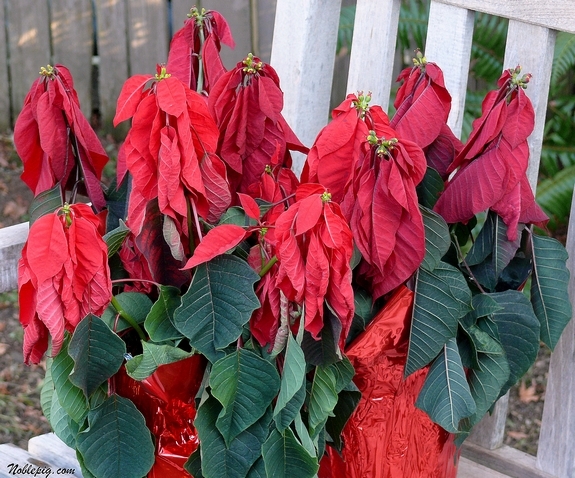 Poor poinsettias! I can’t keep them alive either. I’ve never smelled the scent of hazelnuts roasting. But if it smells anything like hazelnut coffee, it’s got to smell heavenly. My weekend? Just like my weekdays…busy, busy, busy! I can’t wait to try those teas! I am not liking how cold it is here – my skin is so dry is killing me. UGH. We are frozen here too! Love those teas. Aw, crap, now I want that tea!!! 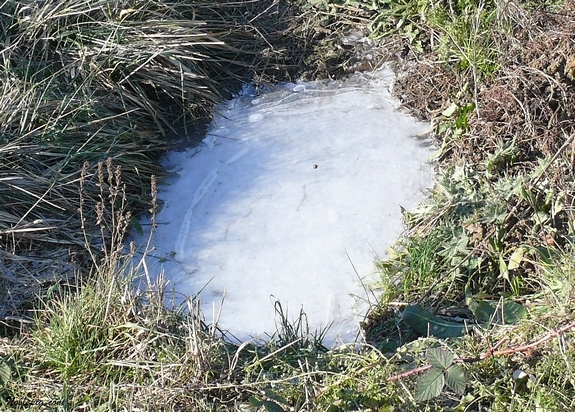 We’ve not had a real cold snap – yet. It will change. More snow and maybe ice is forecast for tonight. Love your ring Cathy, it’s sparkle … are you really using it for decoration? No, that’s really an ornament!! We actually got a freeze down here that killed our cacti! 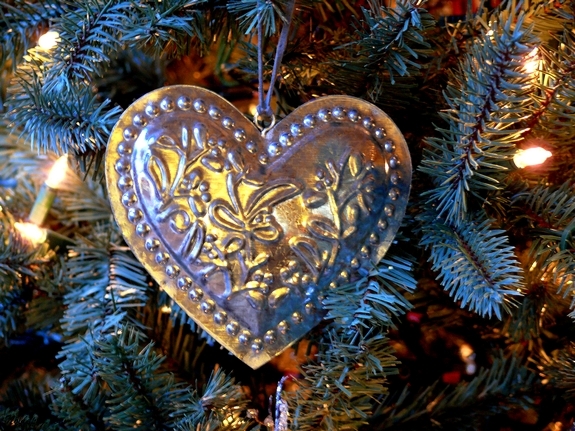 Those poinsettias need help and I love your favorite ornament! I’m jealous of your holiday decorations! I haven’t come close to finding the time to decorate yet. I need a clone! That’s how my poinsettias look even when I put them indoors. They always die on me. I’m not sure what I’m doing wrong. Hmmm. I love hazelnuts! I can just imagine what that place smells like. Such a pretty birdbath! I hope the ice didn’t hurt it. 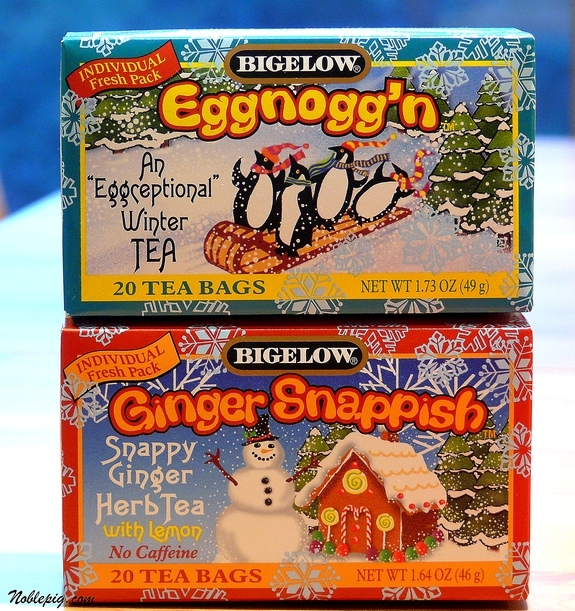 Just bought some of the gingersnapish tea for my honey today – I am not a tea drinker, but he likes it when he is not feeling well. I’m not a fan of the Eggnogg’n tea, but the Pumpkin Spice and Apple Cider teas are good. All of that is just all kinds of wonderful!